I was in a taxi in downtown Frankfurt back in April when a black S4 crossed our path. I stuck my camera phone out the window to grab a pick, but it nearly got knocked out of my hand by a scooter squeezing by! Needless to say, I missed the pic, and because I didn't know how to say "Follow that 928!" in German, it was one that got away. I spent the most this Sunday at the Porsche museum, and had a couple of hours at the Mercedes-Benz museum. Great stuff. The Midnight Blue 928 GTS - 5 speed and no sunroof. The American Sunroof Corporation 4 door station car. Not to be confused with the Porsche 942 station car, given to Ferry Porsche as a birthday present. The 1982 all-aluminum body 928S (designation 948 D 49). I took a lot of photos, and this particular car sems to have a front suspension, different from most other 928's. 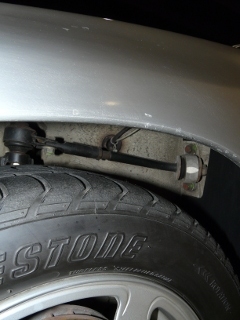 No upper A-arms, but an adjustable rod hinged near the rear bulkhead of the wheel well. The spring/damper assy is lying more down than the normal design, and the spring has quite a few more windings. 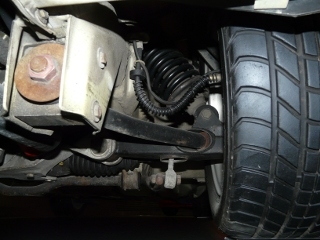 The connecting link to the anti roll bar is bolted to the center of the lower control arm. I will post pictures later today. As promised. All pictures are of the left hand front wheel. Picture 1 is taken from below, aft of the wheel and facing straight up. The adjustable rod is linked to the rear bulkhead, and also to sidewall, and thus forming an adjustable triangle, although bigger than the standard A-arm. The attachment point of the spindle/upright assy is higher than on the standard design. By leverage it should be less forces on the attachment points, but the geometry is also changed, I guess. Picture 2 is taken from forward of the wheel, facing backwards. The different lower control arm as well as the attachment point of the stabilizer is visible. See also the different spring as well as spring orientation. 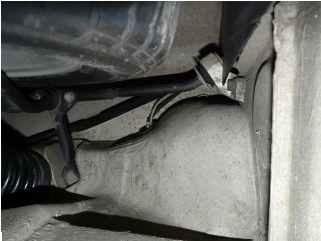 Picture 3 is taken from the sida, towards the wheel well and it shows the adjustable rod and how it is attached. I can provide pitures in higher resolution if wanted. VERY ODD... Looks like it has the same tires on it that were designed and built originally for the 959... the RE? ?-Denloc's from Bridgestone. I'm glad you were able to get these pictures. I saw the car during a private showing before the musuem opened and I was not allowed to take any pictures. Lots of interesting stuff going on there. I took some liberty to shoot those photos. Of the 300 visitors that day, I guess I was the only person spending most of the time lying flat on the floor. All those german gentlemen with their spitzen-frauen on their sunday outing did probably not appreciate my savage behavior. But I got the photos. The 959 tires were developed in cooperation with Dunlop and were named DENLOC. The tire currently recommended by Porsche for the 959 is the Bridgestone RE 71. But Your comment of the 959 triggered me. The 959 development started around 1980 and the car features a double wishbone front suspension. The 959 and the 928 share this concept, whereas the 911 range does not. 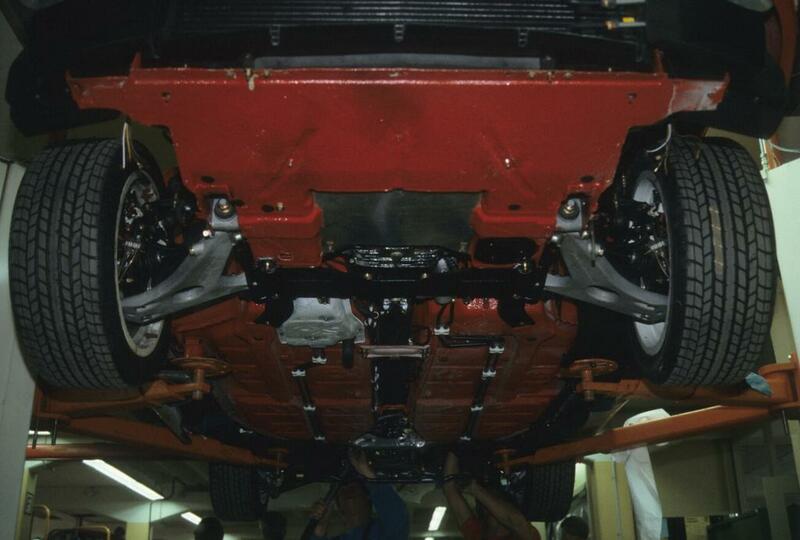 The 928S aluminum car has some details that are similar to the 959 front suspension (lower control arma and attachment points). See the attached pictures for comparison. 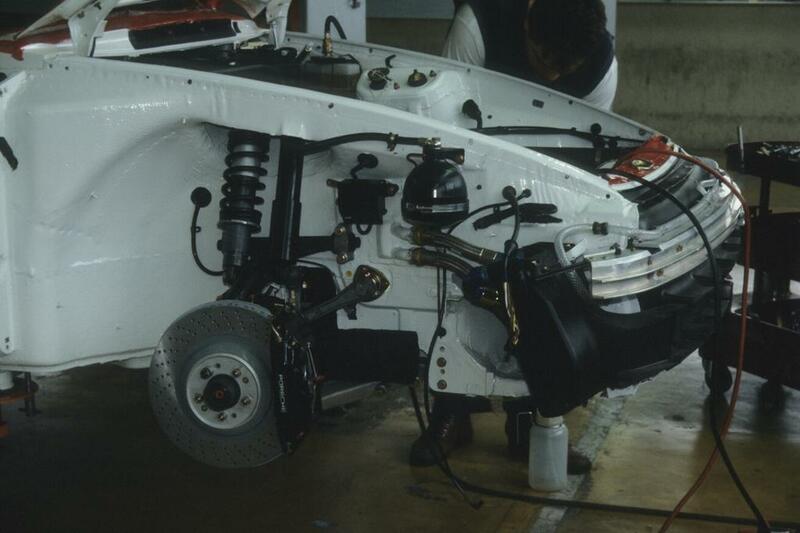 As we know, the 959 suspension ended up with dual dampers, and being somewhat different from the 928, but could this be an early stage of the development of the 959 front suspension ? 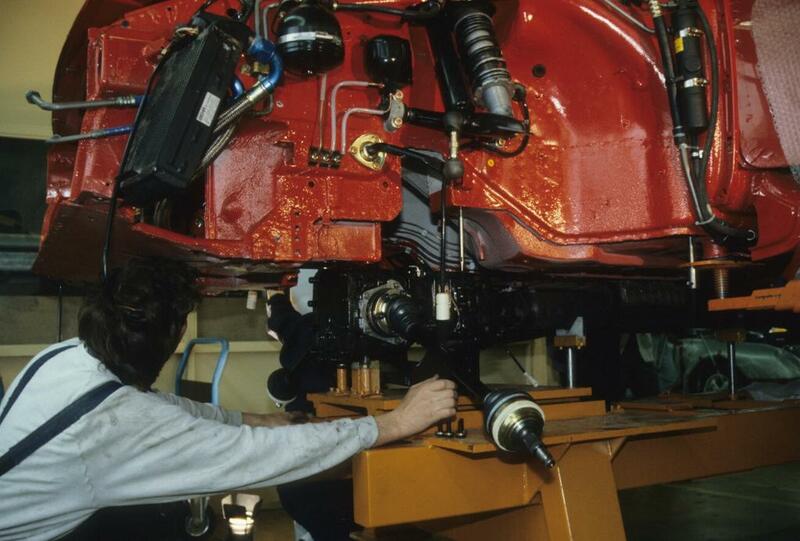 Bear in mind that the front suspension of the 928 was developed from scratch, starting early '70-ties, and had only been in production for a few years, when this car was made, Was there a reason for changing the front suspension so much already after a few years ? Was there a reason for changing the front suspension so much already after a few years ? Maybe alu body could not use normal suspension due to it puting too much force into single point. You are probably right. By extending the distance between the pivoting points, the forces are reduced.